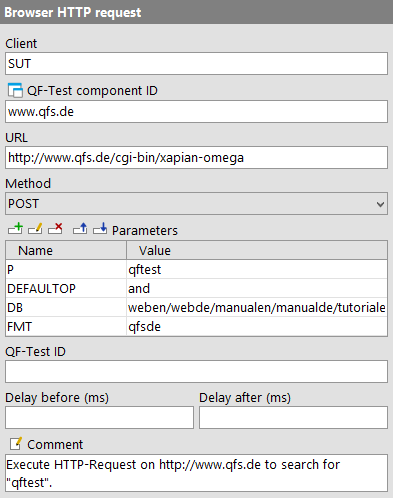 This section describes how to send HTTP Request using QFTest. Web This highly specialized node sends a GET or POST request via HTTP/HTTPS directly to a web server. Such a request can be very helpful for load tests or mass data computing scenarios (e.g. filling out a form) since the simulation of user interactions and the respective loading time of the SUT are omitted during replay. The use of requests is an enhancement of the functionalities for load tests and data-driven testing described in chapter 26 and section 38.4. If the status code returned from the server is 400 or higher, a corresponding error message is created in the run-log. A detailed description of the different status codes can be found at http://www.w3.org/Protocols/HTTP/HTRESP.html. Additionally you can store the response from the server in a variable and if the attribute 'Add server response to run-log' is active the response is also written to the run-log. Execution: The GET/POST request is sent directly by QF-Test via HTTP/HTTPS to the specified URL. If the status code returned from the server is not equal to 200 (status=OK) a corresponding error message is created in the run-log. The URL to which to send the request, not including parameters. HTTP and HTTPS are acceptable values for the protocol. This attribute defines the method of the request, GET, POST,HEAD, PUT, DELETE, TRACE or CONNECT . Here you can specify the parameters for the request. The parameters will be URL encoded by QF-Test at execution. See subsection 2.2.5 for further information how to work with the table. To use custom headers you can set them with this value. You can specify the name of the header and the header value. See subsection 2.2.5 for further information how to work with the table. For POST Methods additional payload can be attached to the request. It can be of various types like plain text, JSON or XML. To successfully add the specific format the "Content-Type" header needs to be set to the corresponding value. For more information about the "Content-Type" see: https://developer.mozilla.org/en-US/docs/Web/HTTP/Headers/Content-Type. The name of the variable to which the HTTP status code is assigned (see chapter 7). The name of the variable to which the response headers value is assigned (see chapter 7). The name of the variable to which the server response is assigned (see chapter 7). This flag determines whether to create local or global variable bindings. If unset, the variables are bound in the global variables. If set, the topmost current binding for a variable is replaced with the new value, provided this binding is within the context of the currently executing 'Procedure', 'Dependency' or 'Test-case' node. If no such binding exists, a new binding is created in the currently executing 'Procedure', 'Dependency' or 'Test-case' node or, if there is no such node, in the global bindings. See chapter 7 for a detailed explanation of variable binding and lookup. If activated the server response is written to the run-log in addition to the status code. Time limit in milliseconds until the HTTP Request must succeed. To disable the limit, leave this value empty. This attribute determines what happens in case the time limit is exceeded. If set to "exception", a CheckFailedException will be thrown. Otherwise a message with the respective error-level will be logged in the run-log. Execution: The GET/POST request is sent within the browser via HTTP/HTTPS to the specified URL. The response is shown directly in the Browser. The name of the SUT client process in which to execute the request. The 'Web page' in which the request should be submitted. Internationalized domain names (IDN) are not supported in the URL attribute as well as links to local file system starting with 'file:///'. This attribute defines the method of the request, GET or POST. Here you can specify the parameters for the request. The parameters will be URL encoded by QFTest at execution. See subsection 2.2.5 for further information how to work with the table.